It’s become on of the most talked about movies, Netflix’s Bird Box. But, its also become a viral social media challenge. That challenge is promoting Netflix and local law enforcement to issue a warning. SOUTHFIELD, Mich. (WXYZ) — It’s become on of the most talked about movies, Netflix’s Bird Box. But, its also become a viral social media challenge. That challenge is promoting Netflix and local law enforcement to issue a warning. "Challenges are getting out of control," Royce Robinson said after hearing about the Bird Box challenge. The challenge came from the movies plot where people are forced to wear blindfolds to prevent them from being possessed by demons and prey on their worst fears. "It’s a big problem, I mean, people are taking this social media stuff too far. I mean you could get hurt or killed doing some of these challenges," Robinson said. On Instagram we searched bird box challenge, and found a slew of pictures and videos. We found one of two girls blindfolded in the street taking a selfie. Nothing was more disturbing than an Instagram video showing a man coming out of a shed blindfolded swing a pick-axe at anything in his way. 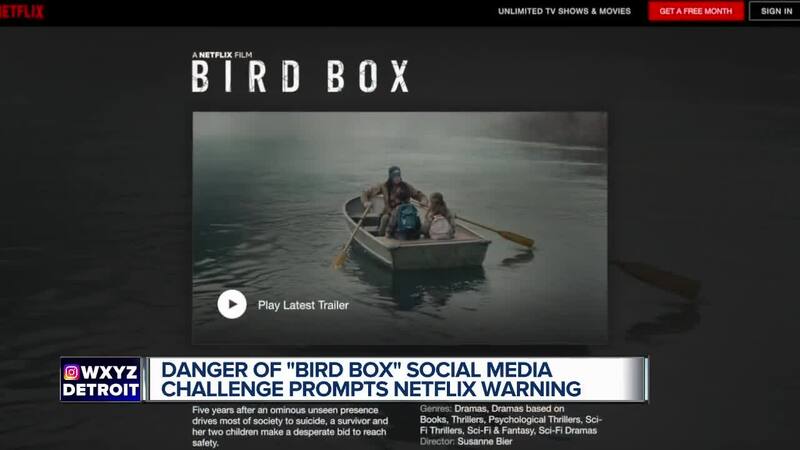 The viral challenge is prompting Netflix to issue a warning on Twitter saying, "Can’t believe I have to say this, but: PLEASE DO NOT HURT YOURSELVES WITH THIS BIRD BOX CHALLENGE. We don’t know how this started, and we appreciate the love, but Boy and Girl have just one wish for 2019 and it is that you not end up in the hospital due to memes. The social media challenge is also catching the eye of the Eastpointe Police department. They posted a message on Facebook with a picture of someone blindfolded behind the wheel of a car. Above the picture police wrote in part, "Netflix and the Eastpointe Public Safety Departments suggest you don’t do this. Be safe, not an example!" "Your life is not worth no likes. Your life is worth more than likes," Robinson said. Most of the videos end with people either falling on walking into things. The good news is so far no injuries have been reported.